The farm-to-table buzzword is well-established now at restaurants across the country, and many chefs are finding ways to thoroughly integrate the locavore ethic into their kitchens. Yet it’s not every day we hear about locally sourced food in tandem with Asian cuisine. 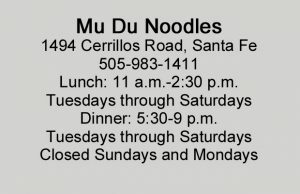 But at Mu Du Noodles in Santa Fe, that is exactly what owner Mu Jing Lau and executive chef Michael Patrick McCann are serving up five days a week. 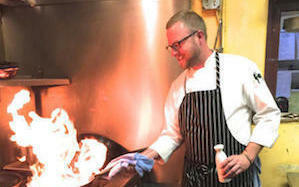 “There are two reasons that I chose this job after coming to Santa Fe. 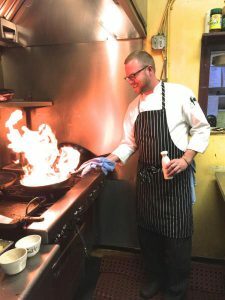 One was Mu’s stellar reputation, and the other is the style of cuisine here,” says McCann, who began working here just eight weeks ago after arriving from Bend, Ore. Chefs who rely on local produce have to be nimble and ready to adjust to the season, finicky weather and the local food supply. The week in mid-June that I spoke to McCann, some of the locally grown and raised food that was coming into the kitchen included baby lettuces, cilantro, sprouts, daikon, spinach, kale, radishes, snap peas, bok choy, eggs, lamb and pork. 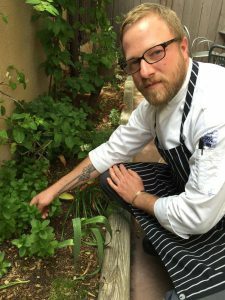 Locally grown produce is beginning to hit its stride this time of year in New Mexico, but chefs who may feed hundreds of people a day need consistency. “A lot of the locally sourced produce ends up in daily specials because sometimes you may only get a case or a case-and-a-half of baby bok choy,” he explains. “Mu still goes to the market twice a week. Sometimes she even hops behind a farmer’s table to help them sell if it’s a busy day. We’re also just starting to use Squash Blossom, a local farm-to-restaurant distributor,” says McCann. 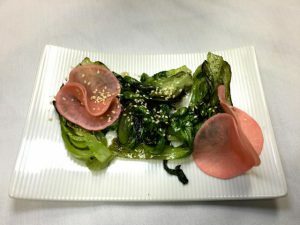 If your mouth starts to water when you think of Asian food, dishes like McCann’s Korean Jap Cha or Thai Charred Bok Choy with Pickled Radish will do the trick. 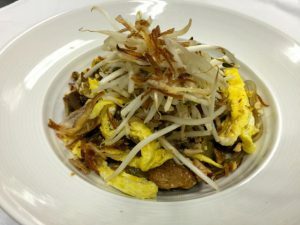 Jap Cha – a sweet potato noodle dish with chicken, beef, Napa cabbage, mushrooms and spinach in Korean chili sauce with toasted sesame oil, soy, walnuts and egg – is featured on the lunch menu. Its depth of flavor and balanced textures keep your fork busy and your mouth happy. Another terrific lunch option is Korean Pork Tacos. The braised pork shoulder is tender with great barbecue flavor, and the spicy cabbage and cilantro slaw with kimchee has a touch of sweet Asian pear that makes the dish sing. Starting today, lunch service will be expanded to five days a week. Judging by the number of would-be patrons who came to the door on a Wednesday, this will be welcome news. Watching McCann cook, his love of authentic food preparation is clear. For example, while some cooks might prefer a food processor to make a Thai chile paste, he says that he likes using a mortar and pestle because of the feel of the process. McCann says that while he has never cooked quite this much Asian food, New Mexico is providing him with a great canvas for exploring spicy dishes. “One of the things I like about New Mexico is the heat of the chile in restaurants. If something is supposed to be spicy, it should be. And people like hot food here,” he says. In addition to supporting local farmers, some of the local businesses the restaurant patronizes include a local butcher shop that provides them with items like charred scallion and hoisin pork sausage, a local bakery, a local tortilla shop and a local spice shop. Does all of this locally sourced food affect prices? “Prices have to reflect where the food is coming from and how much it costs,” notes McCann. That said, he adds that prices here are well-aligned with area eating establishments, including those that don’t provide organic and locally sourced ingredients. 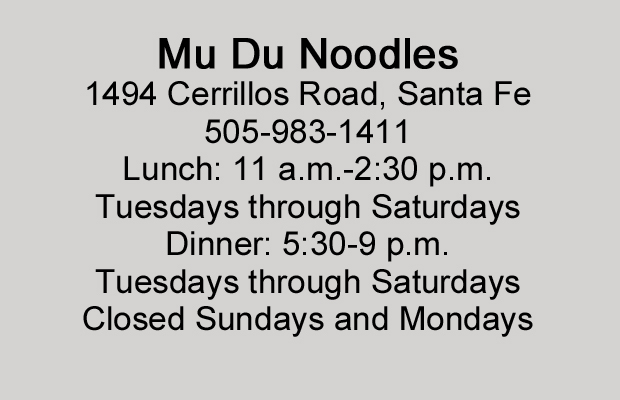 Mu Du Noodles currently serves beer, wine and sake. In summer, you can also have a shrub on Mu Du’s back patio. Not to be confused with a bush, a shrub is fruit syrup, preserved with vinegar and mixed with water or alcohol to make a tangy, refreshing beverage. At Mu Du’s, they make them with sake. And, while you’re on the patio, see if you can spot some of the kitchen garden herbs like mint, chives and Thai basil. McCann’s advice for home cooks? Simple recipes are the best. Use a few ingredients, focus on the flavors and don’t get discouraged if some of your recipes don’t work out. “I try not to make anything too complicated. I come out of the kitchen and talk to guests. If you have any questions about the recipes I’ve provided, come into the restaurant and ask me,” says McCann in his genuinely friendly manner. And that’s a fresh, local offer that’s hard to resist. Clean any outer leaves and stem of bok choy and quarter. In a mixing bowl, coat bok choy with oil and desired amount of salt and pepper. Place on medium high heat and grill and char until root end of the bok choy is tender. Remove from heat. Slice radish thin with knife or mandolin and place to the side in a heat-safe container. Place all ingredients of Radish Brine in a pot on stove and bring to a boil. Once liquid boils, pour over sliced radish and allow it to sit at room temperature and pickle for at least an hour. Pickled radish may be stored in refrigerator after an hour. For Thai Chile Sauce, place garlic, chiles and cilantro stems in mortar and pestle and grind into paste. Add paste to remaining ingredients in a mixing bowl and whisk. For final dish, toss charred bok choy in Thai Chile Sauce. Transfer to serving dish and garnish with pickled radish. You may also garnish with chopped cilantro and sesame seeds if desired. COOK’S NOTE: This simple dish is tasty and light. You can also use the Radish Brine on other summer vegetables such as carrots, cabbage, daikon, etc. Bring a pot of water to a boil and cook noodles for 5 minutes. Be sure to stir noodles so they do not stick together. Drain noodles in a colander and run under cold water to stop the cooking process. Once the noodles are cold transfer to a mixing bowl and mix in 3 tablespoons sesame oil to keep the noodles from sticking. Then cut the noodles into 4- to 5-inch lengths with knife or scissors. For sauce, mix all ingredients together and set aside. In hot sauté pans with rice bran oil or grape seed oil, sauté mushrooms, spinach, onion, and peppers with minced garlic, salt, and pepper. For best results, cook all ingredients at separate times as each vegetable cooks differently. Transfer to a plate or sheet pan and chill in refrigerator. To assemble dish, mix all the veggies together in a mixing bowl with meat. Add the same amount of noodles there are vegetables into the bowl. Sauce to desired amount, usually about 1-2 ounces. Mix well and transfer into serving dishes. Garnish dish with egg ribbons, bean sprouts and peanuts. You may also add fried shallots to the top if you are feeling ambitious and want to do some deep frying. COOK’S NOTE: Any oil is fine, it will just keep the chilled noodles from sticking together. Sambal is a chile paste.